Summers are best spent lakeside with friends and family. Located on Sucker Lake, less than ten minutes south of the charming Village of Rosseau, this cottage is just under 2.5 hours north of Toronto. The village offers many cottage country basics: a general (grocery and hardware) store, lots of antique stores, a library, coffee shops, The Crossroads Bar and Grill, and an LCBO, among others. Stop by the historic Rosseau General Store for delicious ice cream and stroll down to the waterfront park and marina to sit under a gazebo and watch the boat activity on Lake Rosseau. Getting here is easiest by car. That said, we don't have any bright signs like you'd see in a hotel or resort so finding our driveway and getting to the right cottage is a little tricky. Lucky for you, we've put together some fool-proof directions and tips for where to safely leave your car. This Viceroy style cottage sits on a quiet and private wooded lot on Sucker Lake down a treed driveway away from the main road. A large private deck wraps around the lake side of the cottage and overlooks the trees with a little bit of a lake view peeking through. 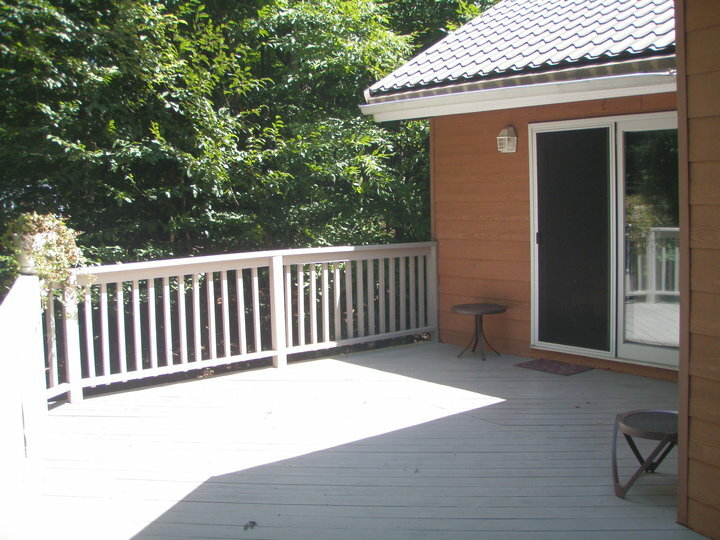 Accessed from the living room as well as one of the bedrooms, this enormous deck is great for soaking up the sun or bird-watching. In the summer months, the outdoor BBQ and patio set help share meals in the great outdoors. Watch your step; there are plenty of friendly little chipmunks and squirrels that often run across the deck. From the back of the cottage, a rocky and wooden path leads down a natural slope to a rocky waterfront, where the shore is made up of pebbles and sand. Explore the calm waters of Sucker Lake on paddleboat or canoe, or enjoy the lovely lake view and loon calls from shore. A 40-foot dock extends onto the lake from the shore, offering a great spot to lounge, sun bathe, and jump into the lake from. Sucker Lake Cottage has a modern and bright interior with giant windows, cathedral ceilings, four bedrooms, and two bathrooms. The cottage features dark, rich and durable laminate flooring, knotty cedar cathedral ceilings and floor-to-ceiling windows that let you enjoy the outdoors whether you're inside or out. Flanked by windows, the heart of the cottage is undoubtedly its large living room area, with an L-shaped sofa around the TV and a group of sofas around the wood fireplace so there's room for everyone to sit and unwind. There is a DVD player, TV and radio, and in case you forget to bring reading material, there is a small selection of books and a very large selection of outdoor/fishing/gardening magazines, including years worth of old Cottage Life issues. There are also plenty of board games. The fully equipped kitchen features beautiful stone tiles and oak cabinets and includes anything you may need such as cutlery, dishes, pots, baking pans, cookbooks, and full-size appliances such as a fridge/freezer, stove/oven, built-in dishwasher, coffee maker, toaster oven, and microwave. On the other side of the center kitchen counter is a bright and sunny dining room with an extra-long table; the perfect place for large family-style meals, board games, or enjoying your morning tea or coffee while admiring the hummingbirds flying by the feeders hung outside. The bathroom on the main floor is complete with cedar ceiling, oak vanity, toilet, sink, and a shower/tub combo. There is also a laundry room with a washer, dryer, wash basin and chest freezer. At the end of the day, you'll sleep well in any of the cozy four bedrooms. Each bedroom has a bedside table and plenty of storage space. Two of the downstairs bedrooms have a knotty cedar feature wall, high sloped ceilings, and a king or queen bed, and one of those has a sliding glass door leading onto the deck. The third downstairs bedroom has 2 beds (a single and a double). Upstairs, the private fourth bedroom looks over the living room on the main floor, and features a queen size bed, a cathedral ceiling, and an attached bathroom with toilet, sink vanity and a shower/tub combo. A $1000 refundable deposit applies (in addition to the rental fee). Please note we only accept weekly rentals that start at 2 PM on Saturday and end the following Saturday at 11 AM. This applies to single-week and multi-week bookings. Check our calendars to see if the dates you prefer are available. Looking to book? If you have any questions or would like to inquire about Sucker Lake Cottage, contact us with the details below. Watch out for typos. Enter a valid email address to ensure we can reach you. Note only Saturday to Saturday bookings are accepted. Please tell us how long you're looking to rent for, how many people in your group, how many adults vs. children, how many pets, how many vehicles you plan to bring, if you're familiar with the area, whether you've rented a cottage before, and if you have any questions. Thank you for your interest in our family cottage! We typically respond to inquiries within 1-2 days. Recent guest? Share your experience and help others by writing a review on CottagesInCanada. The cottage is clean and well supplied with lots of space to accommodate larger groups. The area itself is secluded and private, and Sucker Lake is great for a quick swim or paddle in the canoe. The owners were absolutely great to deal with and very flexible in terms of meeting your needs. I would not hesitate to rent from them again. Highly recommended! Magnifique chalet! Notre séjour a été fantastique. Merci beaucoup de l’hospitalité. Fantastic cottage. Great lake. Really nice area. ...Overall: amazing value. Highly recommended. We chose this cottage over other cottages mostly because of its adorable website (especially the cottage activities and FAQ info). Their helpfulness, honesty and attention to detail all go to show that the owners go above and beyond to make your stay as fun/relaxing/comfortable as possible. And it was! Nice getaway for families! Friendly owners. Clean and very relaxing environment. Good amount of fish to catch! Note: Rates and policies may vary when booking through a third party site vs. booking directly. © 2019. Sucker Lake Cottage.